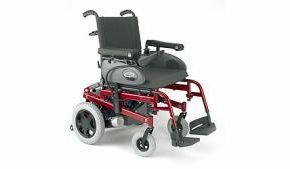 Quickie's Rumba Electric Wheelchair is tough but adaptable to meet the specific needs of one user: seat height, backrest height and angle, leg rest height, armrests, and seat width can all be adjusted. It's also easy one of our most foldable, easily transportable electric wheelchairs and comes equipped with sturdy anchor points for car transport too. The tyres are puncture proof. There are also some optional extras and customisations: you choose which side the joystick control should be fitted on, and whether you want a kerb climber or extra-long-range 50Ah batteries. The Rumba comes in red or silver finish. We like to make absolutely sure every customer gets the perfect chair with the right options, so please call us on 01642 805050 or email enq@activemobility.co.uk to place an order for this or any other electric wheelchair. Armrests are height adjustable from 18-28cm (7-11") from seat.